Praying Through Cancer, a daily devotional written specifically for cancer patients by cancer patients with insight, wisdom, and clarity found only through personal trial. Cancer can't be explained away. No amount of Christian cliches will decrease its power. 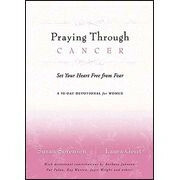 Enter Praying Through Cancer, a daily devotional written specifically for cancer patients by cancer patients with insight, wisdom, and clarity found only through personal trial. Even with cancer, an uncertain future, and a complete lack of control it is possible to experience the grace and provision of Christ's love. The focus of each daily devotional is prayer - personal encounters with God - where fears and anger are transformed into confident expectation and pure worship. Readers will feel as though they are meeting kindred spirits, old friends who will come alongside them in their journey, encouraging them and understanding what no one else can. Contributors include Kay Warren, Pat Palau, Barbara Johnson, Joyce Wright, and many more.